As many of you know it’s extremely commonplace in literature on language loss and revival to see “economic forces” listed as a key causal factor driving language shift. But there’s rarely a detailed explanation as to how this process plays out. This talk is going to be in part a stab at that, as my whole PhD is. Seeing as neoliberalism is, as we’ll see, the dominant economic model both in Ireland and internationally, I’m going to use that to frame my discussion. But another reason I want to talk about this is that I often think it’s not quite understood by people in this field, not to mention the general population. I don’t want this to come across as patronising as I’m sure many of you are familiar with this background, but I also don’t want to make the perhaps even worse mistake of assuming everyone is familiar with a term that is often misused or employed in a rather jargonistic way. I think it’s helpful to try to clarify what it entails so that it can be used analytically as opposed to in the flippant manner that it so often is. By neoliberalism I mean the present phase of capitalism. It was initially theorised as an ideology by economists such as Friedrich von Hayek, Milton Friedman, et al. from the mid-1940s-60s. It was originally a fringe movement but eventually emerged as ideological hegemony in the early to mid-1970s. There were many reasons for this, but it ultimately was to do with the falling rates of profit in capitalism globally at the time: the result of Vietnam and other anti-systemic movements across the globe, the oil shock in 1974, internal contradictions of Keynesianism, but also due to the US dollar coming off the gold standard in 1971 which allowed for the growth of financialisation, and so on. In popular discourse neoliberalism is often conflated with laissez faire liberalism or free market libertarianism, but it’s actually distinct from these – that’s why it has its own name. Similar to these ideologies, however, neoliberalism sees the market as a “super information processor” which is capable of maximising “utility” – as economists like to call it – and distributing resources with an efficiency that human planning can never hope to match. But contrary to a lot of popular belief, neoliberalism actually sees a role for a strongly interventionist state – but it should only intervene in favour of capital. This is a key point that people often miss. The argument goes that by creating a regulatory framework that facilitates profit making above all else we will all be better off. Friedman and Buchanan and other neoliberal ideologues very explicitly state that the pursuit of profit is amongst the highest moral acts. This is because, as they say, wealth will “trickle down” from the top and raise all boats. Of course, what actually happens is that a tiny minority get absurdly rich, giving us levels of inequality that are literally unprecedented in all of history, where the 1% of the world now owns 50% of the wealth and so on. But nonetheless, the state, according to neoliberalism, shouldn’t be significantly involved in other areas of social provision or policy. This then leads to the steady destruction of a whole host of welfare provisions – health, education, and, as we’ll see, language revitalisation measures. If any of you have ever looked at Hayek’s The Road to Serfdom, the foundational text of neoliberalism, you’ll know that it’s largely a 250-page rant against social planning. Which is problematic when we think how much the Language Planning and Policy (LPP) literature points out that language planning is necessarily social planning and that, as Suzanne Romaine says, “arguments in favour of doing something to reverse language death are ultimately about preserving and sustaining viable communities”. Or as Spolsky, another big name in the field, puts it; “it is changes in society that affect linguistic diversity, so that it is social policy rather than language policy that is needed to maintain it”. Seems like a reasonable position to most of us in this room I’m sure. 2) It being so explicitly anti-collectivist that it says there’s “no such thing as society” anyway, as Thatcher famously put it. Another point to note which follows from all this is that neoliberals explicitly reject the concept of social justice. They believe that as this argues for the need to redistribute what that market has (allegedly) justly allocated, social justice arguments are neither social nor just. The market is understood not just as an economic, but also as a moral force. How has this global trend been reflected in Ireland? Well the Celtic Tiger really saw the neoliberalisation of the Irish economy, to such an extent that Ireland is now one of the most globalised states in the world. Indeed, it’s been consistently in the top 3 for the last 20 years – largely because of the “openness” of our markets, which is just another way of saying that we operate as a tax haven for international capital. The Heritage Foundation, which is a think tank Milton Friedman’s acolytes set up in the early-1970s to promote neoliberal policy solutions, says that Ireland is one of the best countries in the world to do business in – and that’s due to the lack of regulatory oversight corporations have to deal with here and the miniscule effective tax rates they pay, far lower than the official 12.5%. The Celtic Tiger saw the Irish state become, as Peadar Kirby and Mary Murphy described, a prototypical “competition state”, one which serves the needs of capital ahead of those of its inhabitants. And as a great many scholars have pointed out, this tendency was greatly intensified in the light of the economic crisis, which is where my own research really takes off. So now I’m going to talk about some of ways in which I think the tensions between neoliberal ideology and language revitalisation efforts have been visible in recent years. Some of them are rather obvious and predictable, but I think some others are less so. To start out with an obvious example, I’d like to say a few words about austerity, which looms large over the other issues I’m going to talk about. As people like David Harvey or Paul Pierson remind us, austerity is not new – they were talking about this way before 2008, pointing out that we entered a period of “permanent austerity” in the late 1970s when the growing costs of the welfare state began to be tackled through retrenchment and recommodification. But the concept of austerity certainly came to public prominence and was greatly accelerated over the last decade. The 2008 bank bailout is a good example of what I mean by neoliberalism advocating for interventions in favour of capital, seeing the transfer of some €70 billion from those on lower and middle incomes to the international capitalist class. And the cutbacks and privatisations that ensued are very reminiscent of Naomi Klein’s concept of the “shock doctrine”, whereby states use crises to push through drastic reforms that would be politically impossible in times of relative stasis. As Milton Friedman put it: “Only a crisis – actual or perceived – produces real change”. I’d suspect that by now many of those who follow the Irish language media know that since 2008 Údarás na Gaeltachta had its budget cut by almost 75%, that the department responsible for the Gaeltacht lost 70% of its budget while getting more work to do, that 13 of 19 “voluntary sector” language promotion bodies were abolished. And so on. 2) Even when they do, the explanations of why this happened are often, I feel, quite simplistic. Irish speakers often see this as a result of Enda Kenny or whoever just personally hating Irish. But I think the real issue goes much deeper. Fine Gael – and I certainly don’t want it to sound like I’m defending them – are operating under a neoliberal hegemony, they (like the others) are a neoliberal party and neoliberalism sees no place for significant state intervention in areas like language revitalisation. It’s also worth remembering that there is an inherent class-bias in austerity. We have a huge amount of research both in Ireland and internationally that shows the cuts primarily targeted the poorest, most vulnerable sectors of society. And with much of the Gaeltacht’s inhabitants, particularly in the stronger Irish-speaking areas, being on the lower end of the class scale, it’s no surprise that they would be the target of inordinately steep cuts. And there’s a very good neoliberal reason for this – the rich, remember, are the ones maximising profits and thereby making everything better for the rest of us. So above all their ability to maximise profits shouldn’t be challenged, even by making them pay for their own mistakes. As I’ve alluded to, state rollback of the welfare provisions that emerged from the post-World War Two Keynesian compromise is a key feature of neoliberal policy regimes. And further to the budget cuts I mentioned – which give a good indication of the covert policy of the state – even overt language policy offers very clear examples of this rollback. I think a point that hasn’t ever really been given the attention it deserves is that the two most significant language policy reforms of the last several decades, the 20-year Strategy and the Gaeltacht Act 2012, were both brought in while the Irish economy was under the control of the IMF-ECB-EC troika. And I think it’s very clear that this impacted both the content and implementation of these policies. It’s hardly worth talking about the 20-year strategy, it having been so totally ignored since it was introduced in December 2010. There’s a lot more I could say about this but as I’m currently working as a consultant for one such voluntary committee I’m reluctant to say much else at the moment. One issue that I do want to raise, however, and which hasn’t received much attention from academics is regarding participation rates in this process. The enormous decline in rates of civic engagement over recent decades has been well-documented by sociologists, as too has the tendency for economic insecurity to exacerbate this trend. And there’s been lots of research that shows that this is exactly what happened since 2008, with rates of voluntary activity falling across the developed west. Not only that, but even when the neoliberal economy is in growth it strongly militates against widespread civic engagement. There are several causal factors we could talk about behind this, and many of them overlap with other issues I’m about to discuss. But with a key aspect of the Gaeltacht Act being predicated on community voluntarism, this trend presents a significant difficulty for the process. Indeed, committees having difficulty recruiting members was something I often heard of during my research. As one of my interviewees said, “Before [you even start thinking about] language planning you need to have a roof over your head and a job”. Relatedly, in polities with weak welfare provisions, people tend to be much more reluctant to accept radical policy changes, a fact which also has obvious implications for the political viability of policies requiring wide-scale, redistributive investment in the Gaeltacht of the sort that is needed to revitalise these areas. Essentially if you know your material needs will be met regardless, you’re much less likely to oppose investment in other areas, to blame the fact that you’re poor on money being wasted on promoting Irish, or that immigrants took your job, or whatever. Furthermore, an important point here is that in general in the west the higher the level of inequality in a society, the lower levels of trust are. And Ireland is an extremely unequal country – even before 2008 1% of the population owned 34% of the wealth. 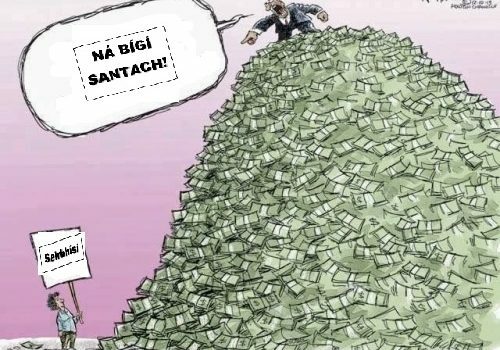 And between 2010-17 the richest 300 people in Ireland doubled their wealth, from €50 to €100 billion, much more than the cost of the original bank bailout. The eleven richest people now have the same wealth as the top 300 had in 2010, and this during the most severe recession in the state’s history. Again, this is a product of basing our society on the trickle-down model – by making the rich richer we’ll all supposedly magically be better off. This is important for those of us interested in language revitalisation as the higher levels of trust that more equal societies exhibit produce exactly the kind of values that are needed for LPP efforts to be supported. As Pickett and Wilkinson point out in The Spirit Level: “trusters tend to believe that everyone should be treated with respect and tolerance”. Sociolinguists talk all the time about language ideologies, but there is tonnes of research showing that ideologies don’t just appear from nowhere, but have a material basis which I rarely see discussed, and which neoliberalism fundamentally impacts. The next two sections address issues that are very closely linked. I’ll try to treat them as discreet phenomena but as I’m sure you’ll see they are very closely related. One issue – itself partly responsible for the contracting rates of civic engagement just discussed – is that of precarity, the lack of stable employment which so many of us now face. I think this is relevant in two regards. One is in relation to the creation of employment in the Gaeltacht. The sort of employment that foreign direct investment has been most successful at creating, call centres and so on that arrive for a year, take the grant and then leave, is typically of a poor standard. It’s low prestige and has limited prospects in terms of long term security or professional advancement. Unsurprisingly, not one parent I interviewed wanted their kids to finish their education and go to work in a call centre, nor did many of the young adults I talked to, especially those pursuing third level education, which as we know is an ever-increasing number of the school-leaving cohort. And again, there’s plenty of research on the way in which rising expectations can be fatal for rural community life. When people no longer feel the options available to them in their home communities are adequate to meet their desires, it quickly leads to brain drain and population loss. Going back to the language planning process, I think that the language planning consultant positions that the Údarás has been advertising over the last few years are another example of precarity and language revitalisation colliding. These short-term contracts with relatively low pay are failing to attract the majority of those qualified to do such work, which, flawed as the Gaeltacht Act is, is still important work. [O]utsourcing support[s] a casualization and peripherization of labor that treat[s] certain jobs within the organization as temporary or “as needed”, and allows for readier workforce control and reduced costs to the state. Ward here was talking specifically about what’s called New Public Management, which I’ll talk about now. For anyone that doesn’t know, new public management is a managerial approach that was developed in the 1970s. The idea was that the administrative bureaucracies of Keynesian welfare states were bloated and inefficient and should adopt the managerial practices of the private sector to overcome this. Which is exactly what has been happening across the public sector for the last several decades. Even before the crash, the OECD said that “Ireland has significantly advanced along a “New Public Management” continuum”. And again, this trend was greatly intensified as a result of the economic crisis, with the Croke Park agreement, Haddington Road and so on seeing tens of thousands of public servants laid off and those remaining getting more work for less pay, less holidays, more demanding targets etc. As MacCarthaigh put it in a recent issue of Administration: “the 2011–16 period became one of unprecedented change for the Irish public service”. It’s almost a cliché for Irish speakers to complain about civil servants being anti-Irish, and while that might well have been true in 1922, I think it’s a very simplistic explanation to say “oh they just hate Irish so they don’t implement the language schemes” which the Official Languages Act 2003 requires. Sure, there are other factors to be considered, but I think it’s obvious that NPM rationalisation has created an environment inimical to implementing such language policies. If you’re an over-worked and under-paid public servant, the Irish language scheme your department is meant to have is probably always going to remain fairly low on your list of priorities. I think the fact that the highest numbers of lapsed language schemes reported by the Coimisinéir Teanga was from 2011-13, at the height of the recession, is indicative of this. As too is the fact that the schemes currently being approved offer much weaker provisions than those in place before this period of “unprecedented public-sector reform” that MacCarthaigh described. I think it’s insufficient to just blame the failure of these policies on Machiavellian public servants who hate Irish for some reason, and that instead we need to examine the structural issues impacting on their ability to attend to such duties. Now of course there are exceptions to what I’ve just described; neoliberalism, like any hegemonic force is an uneven and contested process. But I don’t think that warrants throwing the baby out with the bath water and ignoring it completely. As has been shown in a huge volume of public policy literature published in the last few years, reforms in all sorts of sectors have followed a deeply neoliberal trajectory since 2008. While we surely got a nice new co-op building in Baile an Fheirtéaraigh, for example, that doesn’t negate the fact that total capital expenditure on Irish fell from €71m in 2008 to €10m in 2018. We all know the standard narrative of the state having effectively abandoned its commitment to the language revitalisation project in the 1970s, but what followed was a relatively incremental withdrawal. The recent recession, however, is an excellent example of the way neoliberalism uses crises to “punctuate equilibrium”, as public policy scholars say, allowing for the contraction of state spending on Irish and other areas to an extent that would otherwise not have been possible. I know they’ve recently announced they’re going to increase funding for Irish over some non-specified time frame sometime before 2040, and, fingers crossed, I hope they do. But I suspect that 1) it’s a smoke and mirrors ruse to fob us off and no more will come of it than our last national development plan, which was abandoned a few years ago. And that 2) it’ll be too little, too late. But maybe I’m wrong. Maybe the international proletarian revolution will finally come about, get rid of capitalism once and for all and usher in a post-scarcity utopia. Sure, we’ll give it a shot! Sin é é, go raibh maith agaibh!